Wow. This memoir is gut-wrenching, full of unrelenting pain minute after minute (I listened on audio). I was blown away by the breathtaking account of what happened during the tsunami—knowing that something horrible and dangerous was coming but not entirely sure the full impact, just knowing you have to RUN. I haven’t experienced a loss on this level, so I can only imagine how I might feel, but I completely empathized with Deraniyagala’s profound, debilitating grief. My heart went out to her as she recounts being in a daze immediately after the tsunami, her self-destructive abuse of drugs and alcohol, and her resulting suicidal psyche. The parts where she encounters her family’s material belongings (a pair of shoes, a spoon, the bed she shared with her husband) are absolutely heartbreaking. It does feel like her husband, sons, and parents live on through this memoir—she brought them to life again with her memories and words tenderly and beautifully. However. It’s hard to criticize a personal memoir about such an unspeakable loss, but I did get pulled away from my empathy a bit whenever things implying her financial and social class levels were mentioned—frequent international travel, nannies, lavish vacations, multiple homes, etc. That of course doesn’t devalue her genuine grief—money cannot buy back her family. But I found myself wondering about the other hundreds of thousands of people that lost loved ones in the tsunami, those that live in extreme poverty and didn’t have the luxuries of time and money like she did. She didn’t mention others that were effected by the tsunami like her, or seek out counseling or support groups with other survivors (or victims’ families). I was reminded somewhat of Joan Didion’s The Year of Magical Thinking in this way (another audiobook I tried but DNF—Didion’s extreme privilege I found insufferable to listen to). In fact I was shocked by some of Deraniyagala’s bad behavior, at times seeming supremely ungrateful and downright insane. But then, this is just Deraniyagala’s own personal experience—she wasn’t obligated necessarily to write anything more than what she herself went through. And when you’ve lost the most important people in your life, who make up your whole world and identity, why would you give two shits about what you do or don’t do, or what happens to you? I get that. 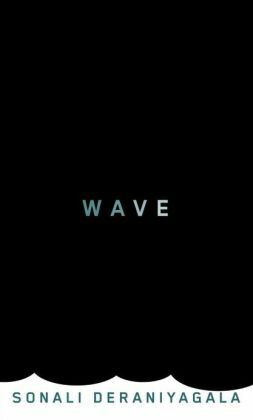 Wave is a beautifully written memoir, with affecting language and well-crafted sentences. I hope that in writing Wave Deraniyagala has found a little more peace on her lifelong journey managing her grief. Read from June 17 to 22, 2014. This entry was posted in books and tagged drama, family, grief, memoir, mental health, psychology, travel by kristin @ my little heart melodies. Bookmark the permalink. I feel like I’ve heard nothing but good things (though very similar reactions) about this one. Just waiting for the right time to read it. Yeah, it’s a really powerful memoir. The audiobook was only about 5.5 hours, if that helps! Not very long.